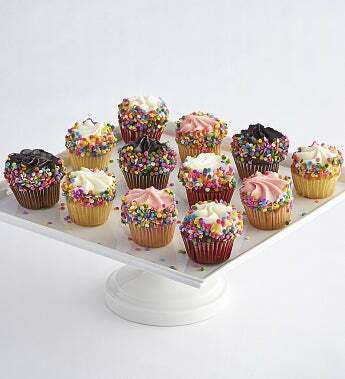 Indulge them on their special day with these scrumptiously delicious mini gourmet birthday cupcakes from Little Whisk. The lucky recipient will love these tasty premium flavors: Chocolate, Vanilla, Strawberry and Red Velvet. All are adorned with festive birthday candies. It's the perfect way to express your birthday wishes! Kosher, OKS. Little Whisk cupcakes are made with only the finest ingredients like creamy frostings, premium chocolate, cane sugars, pure vanilla, and sweet butter. They are packaged with care and shipped to arrive in perfect condition.